One of the most effective things about the new Resident Evil 2 is the care Capcom’s artists lavished on its characters, which goes a long way toward selling its scares again, more than 20 years later. So why not completely ruin those and see what happens? YouTuber DPO23 has made it his business to monkey around with animation in games, often to hysterical effect. He has, for instance, stuck everyone in Telltale’s Jurassic Park: The Game into their default T-pose stances, and completely removed the animations from Uncharted. 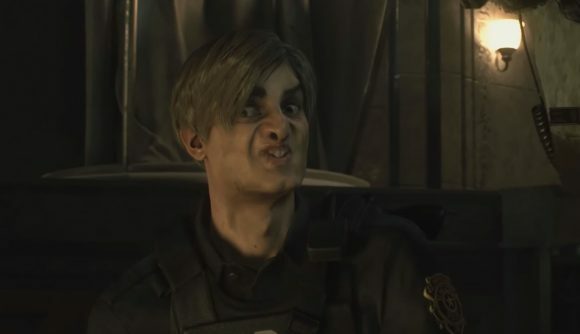 This time, he’s gone and played silly buggers with Resident Evil 2’s facial animations, exaggerating them to the Nth degree. He doesn’t even need to use a scene featuring zombies or other monsters to create an unsettling series of images. Instead, the initial exchange between Leon Kennedy and Lt. Marvin Branagh is the setting for the surreal and horrifying. As Leon tries to convince the lieutenant to leave the Raccoon City Police headquarters, Branagh’s face literally splits open in agony from the zombie bite he suffered minutes earlier. Leon’s eyes skitter back and forth, his face now looking like when Mr. Bean’s does when he smells something unpleasant. It’s a weird combination of horror and comedy, a bit like unexpectedly discovering a clown in your basement. As you may have noticed, the video includes two versions of the scene. In the second, DPO23 has also cranked up Lt. Branagh’s body animations, which sort of breaks everything. Branagh contorts violently and (I believe this is the correct term nowadays) proceeds to yeet off the sofa, leaving his floating service pistol to carry on the conversation with Leon. So that’s fun. If nothing else, it’s an excellent object lesson in the distinction between rigid and soft-body dynamics in computer animation. And that means that this is actually an educational video, right?